I saw this rebellious sounding fella on the weekly Lush Menu post Liz (notoriousliz_54) rolls out for our Lushie pleasure. The Lush Kitchen is based out of the UK and is priced in pounds. Shower gels are 11 pounds and vary in US dollars depending on the current exchange rate. 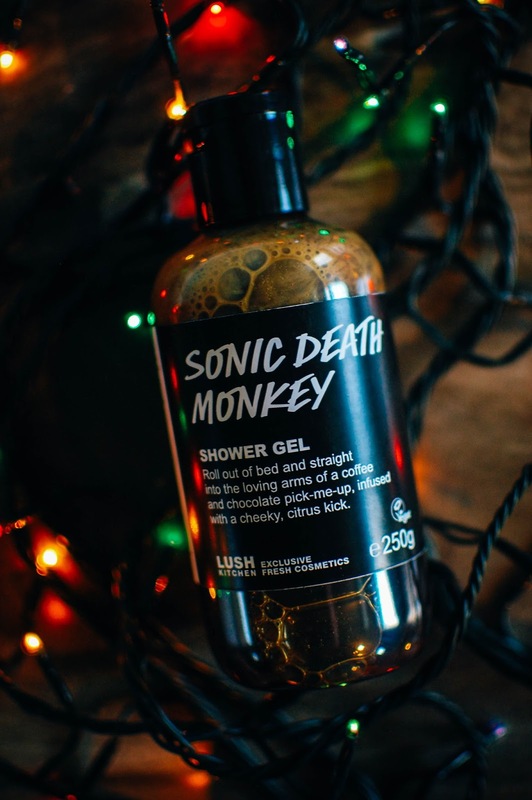 Sonic Death Monkey, I felt initially, was going to either be a scent I would love or hate. With notes of coffee, chocolate and citrus it could go either way. But when I used it in a hot shower it percolated all the senses and jogged my brain through many seasons. First, a blast of thick creamy cocoa butter and coconut that brought to mind endless tanning summer days. Then a sweet orange shaped and flavored chocolate, split into wedges. My stepdad loved getting those atrocious things in his stocking at Christmas, which usually meant my sisters and I would get one too. I don't pick up much actual coffee but maybe the creamy introduction could be construed as a milky latte. I am not sure if I love it or hate it. It wasn't so bad in the shower and I ended up breathing it in a few times in a nostalgic haze. I think I will make a bubble bath out of it next. Have you tried Sonic Death Monkey? Bought from the Lush Kitchen? What are you sudsing up with? Sounds like a weird combo! Is there actual coffee in it? I used to make coffee soaps, which were crazy popular. It is interesting!! Coffee is the first ingredient listed so it has it in spades. I think it is growing on me. I can see how a coffee soaps would be popular! I enjoy it in scrubs. This is a staple for me! I hope you learn to love it! How did you get this????! A piece of my soul has been forever missing since they stopped selling this in US stores. Hi Tara! I ordered it off of the Lush UK website in the Kitchen section. They change the menu weekly and great IG ladies like NotoriousLiz_54 post the weekly menu and I follow along. When she posted that the menu included Sonic Death Monkey I snapped two up. Follow Liz on IG and watch for the Lush Kitchen menu. It will pop back up again eventually. I hope this helps.